In the mountains of the Cauca region of southern Colombia, rich volcanic soils and dramatic thermal differentials in daily temperature at 6,000 feet conspire to create the velvety smoothness and caramel and dark chocolate notes of Viva Colombia! Add to that the community restoration by our partner growers, and this balanced, bright coffee will be your new go-to brew! Direct from the mountains of Cauca, Colombia, fresh, whole, green beans, for the DIY craftsman self-roaster or to take to your favorite roaster. Already have your own roast or grind preferences "dialed-in?" 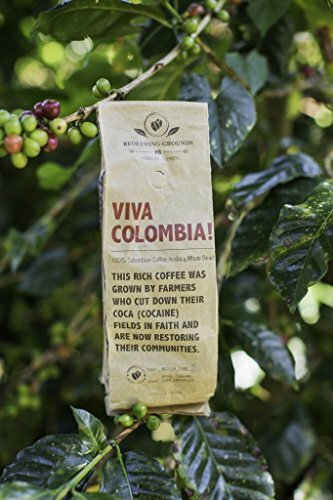 Then this is the perfect way for you to experience the the flavor and aroma of VIVA COLOMBIA! This rich, bright coffee will be your new go-to brew! Sourced from a guerilla controlled conflict zone in Southern Colombia, Redeeming Grounds empowers cocaine farmers to cultivate coffee as an alternative. 100% Arabica, from the mountains of Cauca, Colombia, where volcanic soils and dramatic thermals conspire to create the perfect blend of aroma and flavor. If you have any questions about this product by Redeeming Grounds Premium Coffee, contact us by completing and submitting the form below. If you are looking for a specif part number, please include it with your message.